3.0″ downpipe assembly. 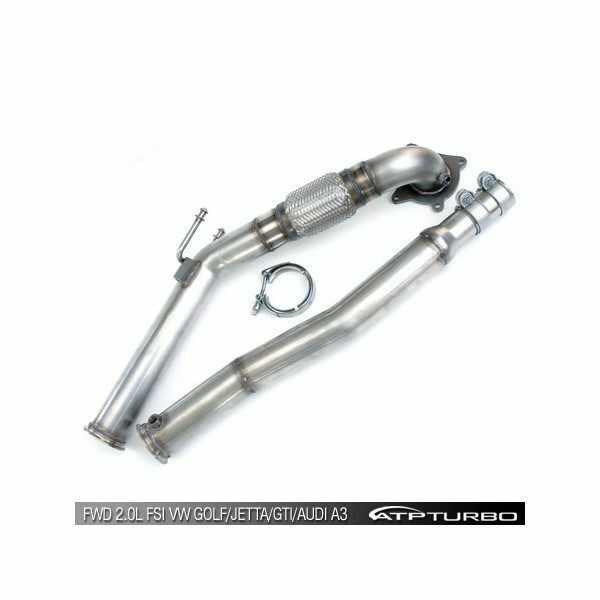 Fits FWD 2.0L FSI equipped VW Golf/Jetta/GTI/Audi A3. 304 stainless with gasketless/aircraft grade 3″ stainless V-Band connection. Includes racing cat delete rear section (can be replace with catalytic converter module later) bolts directly to stock exhaust joint. All CNC mandrel bent and CNC flanges using TIG welded assembly. A must have mod for any “chipped” or “reflashed” vehicle to easily gain big HP and Torque. Over 30 ft/lbs and over 30WHP @ through various parts of the power band (see dyno charts). V-Band system will be fully compatible with future V-Banded rear exhaust modules that will extend rear muffler and exhaust tip. Various interchangeable muffler, catalyst, and resonator options for power and sound tuning will be available to attach to this downpipe. All very easy to install. © 2016 | VAP Motorsports, All Rights Reserved.